My work - and basically my life - is all about (and has always been all about) finding beauty in what has been broken, putting pieces back together, looking at old things in new ways, salvaging what is salvageable, and diminishing any flaws or damage while at the same time, bringing any beauty to the forefront. Every once in a while I come across someone who sees my work for the first time and scolds, "I sure hope you didn't ruin any good china when you made that!" I have to say I've always been taken aback when I hear this. I immediately perceive it as very negative thinking, but maybe it's just because some people just don't realize exactly how many old and damaged plates there are out there in the world that are headed to one of two places: to a landfill, or to my workshop. But still, I'm always surprised when I hear that reaction. When someone sees my jewelry for the first time and learns that it's made from old, cast-off or damaged china, 99.9 percent of the time the reaction that I get is a positive, happy and surprised "Cool!" or something along those lines. But there's always that one person who immediately thinks the worst, first. It's like they don't even see the beauty that is right in front of them. Their mind immediately thinks that a very bad thing has been done! Hehe. Of course now I am exaggerating and being a little bit dramatic - but that's the impression that that type of response gives to me. They think the worst first. But still... before I get too far from my intended point... what's your reaction? What is in the forefront of your mind? Do you keep your mind as a fresh clean slate, open to positive possibilities? Or is it tarnished and stained, and muddied with negativity? Remember a moment ago, when I quoted the negative person who said, "I sure hope you didn't ruin any good china when you made that!"? Understand that to me, it is ALL "good" china. Broken, whole, damaged, scratched, chipped, shards, slivers, pieces, entire sets...it's all good. :) Perspective is everything. 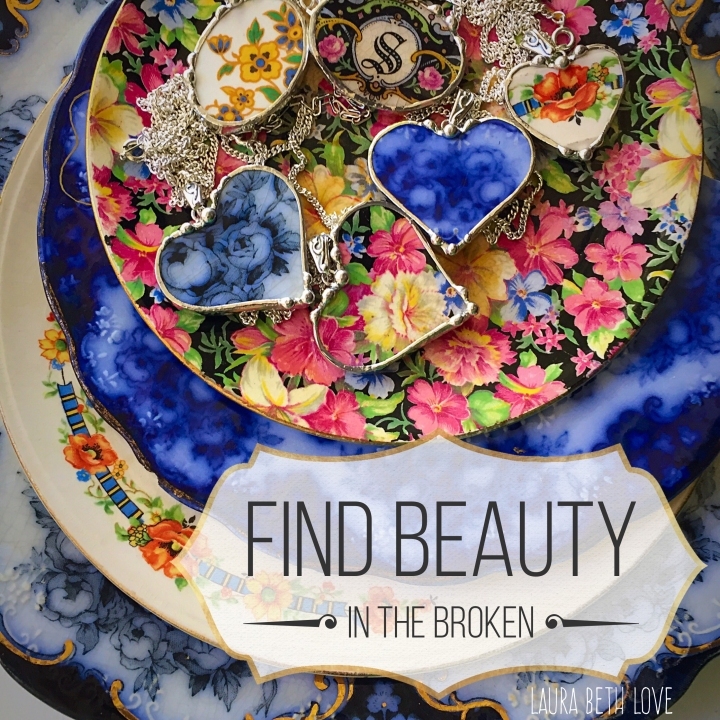 Find beauty in the broken. Thanks Divya, and you're exactly right. As a single mom raising two daughters I find that it's a never-ending daily challenge to go against popular culture that continually tells young women that they need to be or look a certain or particular way to be beautiful. We need to stop the proliferation of perfection! "Good China" sitting in a cupboard gathering dust is WASTED china. At the end of the day, its just a fancy plate that's NOT being used.... WASTE. Turn that plate into something that can be used....now it is no longer a waste! Now it is another beautiful little thing helping make the world a brighter place. These are beautiful! Its great that you are able to make something beautiful out of what would otherwise end up in the trash. But even if you did break "perfectly good" china, at least it would be getting used, not sitting in a box in the attic. Hi Ryan! Those are my thoughts exactly :) The things that we keep in boxes and stash away in the garage or attic kinda land up staying there, don't you agree? Have a great week! Those are beautiful :D I love handmade looking pieces like this, the imperfection is the charm. I'm looking for colorful shattered pieces to fix my kitty's broken ceramic dish (has one chip). I think I'll like it better with the random colorful piece. Isn't it funny how there is always that one person?! Lol But truthfully, I actually kind of feel sorry for those people. Imagine how much life they miss out on due to their close-mindedness, the beauty they don't get to see, the joy the don't get to experience...all because of their negative outlook. I was an antique dealer for over 20 years and dealt extensively in glass and china. People used to ask me if I was afraid to use stuff for fear of breaking it. Things are made to be used and if something was that valuable, I didn't bother with it. Things break. All of the time . They chip, they graze, etc. Better to use something than to store it in boxes for decades. One of my favorite terms is Japanese...Wabi Sabi - perfectly imperfect. I love that. I admire so much what you do. People can be so short sighted sometimes. But, if we all thought alike, it would be such a boring life. Ha! You can only hope that people evolve. How true! Thanks for your thoughtful comments. I agree with them all! Your jewelry is beautiful and you really shouldn't let one person upset you. You are recycling something that may have been thrown away, whether of not it was broken or whole. Never second guess yourself over a one persons opinion.